Among the things a traveller to Corfu sees in almost every souvenir shop is a small citrus fruit, the Kumquat. It was great surprise to me, a Japanese visiting Greece for the first time, to see that the kinkan, as the Kumquat is known in Japan, is so popular on this faraway island from Japan. In fact the fruit was brought to Corfu from Japan in the 19th Century, an interesting coincidence perhaps for Gregorios Manos, a Corfiot diplomat posted to Vienna who collected Japanese and other East Asian arts in the same era. His collection became the core of the Museum of Asian Art in Corfu, where I was lucky enough to be given a wonderful opportunity by the Sainsbury Institute to work as a one-month intern helping with the preparations for opening a new Japanese galley. Readers of this magazine may know that the museum is famous for its ukiyo-e collection, which was highlighted in two special exhibitions, “Sharaku and Other Hidden Japanese Masterworks from the Land of NAUSICAA” at the Tokyo Metropolitan Edo-Tokyo Museum in 2009, and “Masterpieces from the Museum of Asian Art of Corfu” at the Maison de la Culture du Japon in Paris in 2011. However Gregorios Manos had an interest in Japanese arts that extended far beyond ukiyo-e, so although the ukiyo-e collection has been extensively researched by Japanese scholars there still remains plenty of material to be investigated. My internship’s task was to survey Buddhist sculptures, masks, prehistoric stone tools, ceramics and musical instruments for display in the new Japanese gallery; after I returned to Japan I counted the number of works of art I had researched, and found it amounted to more than 1000 objects. As my main field of study is Japanese ceramics, to tell the truth, I was a bit anxious about dealing with such a wide range of art works, beyond my expertise. It was indeed demanding to branch out into other fields, although it was a fascinating and exciting experience at the same time. It was also incredibly rewarding to survey more than 900 pieces from their Japanese ceramics collection. I hope readers of this article will have the opportunity to visit the new galleries and discover the splendour of the art works. The internship connected me, a Japanese student studying Japanese arts in Japan, not only with the Museum of Asian Art in Corfu, but also with the Corfiots. Everyday I worked alongside local staff; we cooperated while surveying the collections in the storage areas and freely communicated our opinions about selecting objects for exhibition and on how they should be displayed. People at the museum were so welcoming that I quickly felt at ease in this new environment. 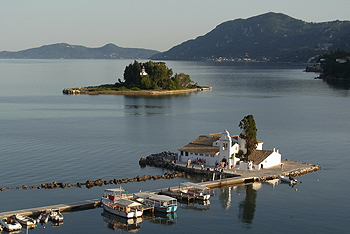 Naturally a one-month stay in Corfu offers much more than a wonderful work experience. I am sure I must be one of many Japanese to have enjoyed this charming island so completely. I had awesome experiences of seeing beautiful scenery, streets and ruins, and of eating delicious and healthy local cooking, often based on tomato sauce. I bathed in the sea for the first time ever! 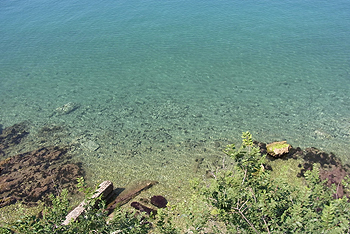 The turquoise blue water was clear enough to see fish swimming beneath me and the gentle waves and the soft sound of the surf made me feel calm and relaxed. It was interesting to observe both tourists and local residents enjoying themselves in the same places. Sitting down in a café or taverna I could often hear waiters greeting neighbours and friends who passed by. Whole families came to the cafés together, and while parents and grandparents drank their coffee, the children played outside in the park, running and riding their bicycles. Warmth between people seems to be a unique feature of life in Corfu. 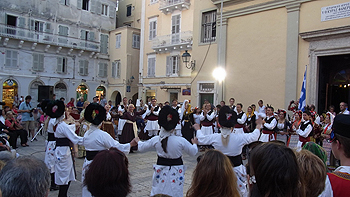 The Museum of Asian Art in Corfu is there for the Corfiots, for all the Greek people and for visitors from across the world. Some people come to the island specifically to see Japanese art but many are likely to encounter the museum unintentionally. I hope that the Japanese arts exhibited in the new gallery will become as familiar to visitors as the kumquat is to Corfu, sustaining the long connection between Japan and this beautiful Greek island.